A few weeks ago I scored – my work gave us the three days off between the two long weekends (Human Rights’ Day and Easter) and I decided that since the cost of airline tickets for 3 of us is out of my reach at the moment, I’d take my children on a little road trip to Cape Town to see their cousins. I’d been reminded several times that they hadn’t seen their cousins in nearly 2 years, and also that they hadn’t been to Cape Town for 3 years. I remember nagging my parents to go to Cape Town when I was a kid. I even remember drawing a picture of some swans who were tired of going to Swaziland every holiday – couldn’t they go to Cape Town for once! So we set off on Saturday morning, having packed the car and trying to start it, only to discover the battery was flat – I had left the lights on for a couple of hours the night before. Sigh. Filled up at a local garage and they told us not to worry – the car would charge the battery as we drove. Okay. There is a kind of freedom that I adore about driving on the open road. It makes me feel like an adventurer – an intrepid explorer. My girls and I took turns choosing the music (although my nearly 14-year-old has developed a really good taste in music, her younger sister is still stuck on a famous British boy band who shall not be named, for fear of another one of their hit-seeking missiles lodging itself in my head again!) and we sang along through Gauteng, over the Vaal River and into the Free State. My playlist was particular excellent, if I may say so myself. We noted that despite the drought, the late rains had left the landscape quite green, and the mielie plants, although small, looked healthy. I can’t help smiling when I see fields of sunflowers – they remind me of a little moment in Tuscany when our tour guide (who was supposed to meet us at the next town while we walked, but ended up driving us because my walking partner had a foot problem) stopped for us to take pictures in a sunflower field. Lovely stuff! We stopped at one of those horrible generic one-stop garages with the inevitable Wimpy for lunch – a welcome break from the driving at that point. Let it also be known that trying to stick to the Banting diet whilst road tripping is quite an impossible task if one hasn’t prepared one’s own food for the trip. Toasted sarmies are perfect eat-on-the-road meals. We tried to hit the road again, only to discover that the battery was still flat. My children became experts at pushing the car, and I learnt to seek out parking spots with a long straight run up which I could reverse into. Sigh again. 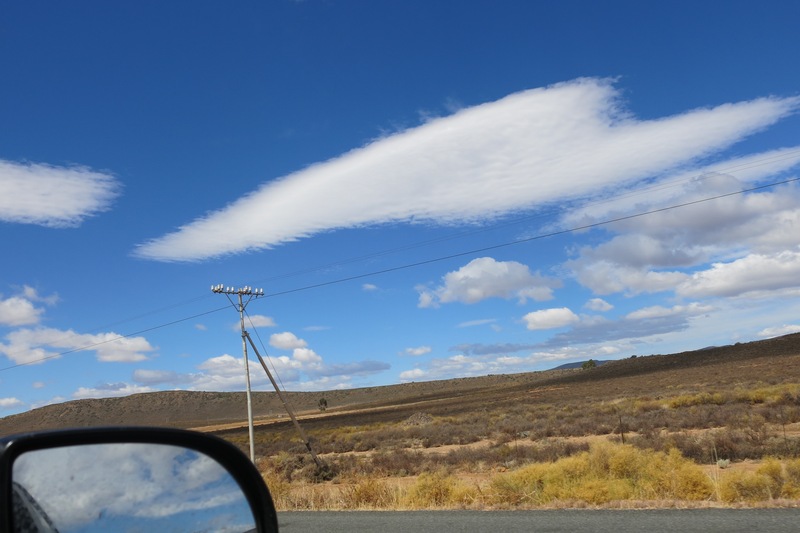 We hit the Karoo, which is one of my favourite places in the world, particularly to drive through. I adore the vast open spaces. 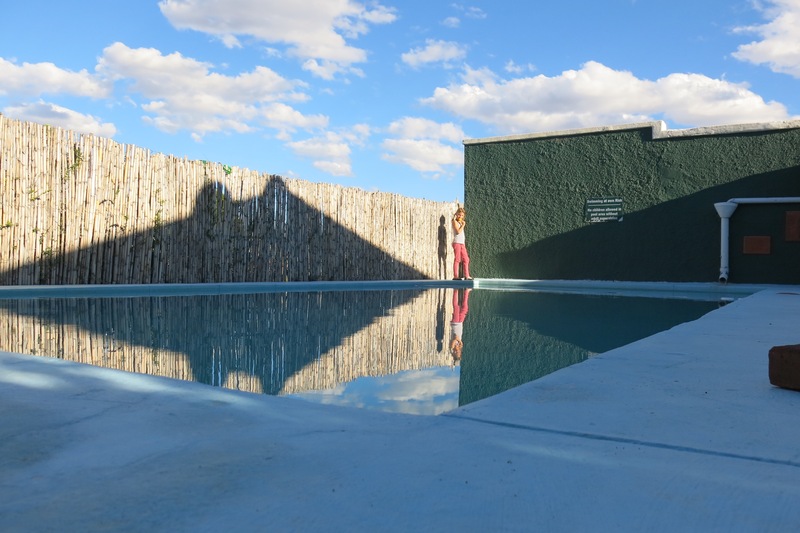 The Karoo gives me an incredibly connected, spiritual and happy feeling. I generally smile as I drive through the Karoo. The girls were mostly stuck in their books (and I must tell you, it’s such a joy and a relief as an English teacher to have children who love books!) as I marvelled over the amazing country of my birth. At Colesberg, I decided to try to get the battery replaced (just in case, you know, it didn’t recharge itself, like it hadn’t for the last 700 kms). We got there just after 2, and being a (very) small town, everything had already closed. A kind man at a garage gave us some good advice: don’t call out the Colesberg battery man, who will charge an after hours fee and a call out fee and R900 for a battery. He assured us that the battery would not die before Cape Town, and we should just keep going. We did. 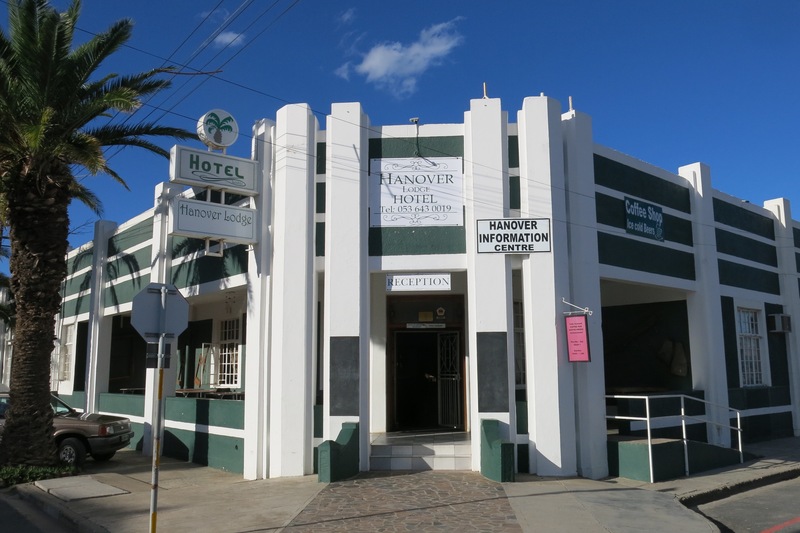 Next stop, and our rest for the night, was the Hanover Lodge Hotel in the tiny Karoo town of Hanover. The town is a flat, dusty place which appears to have nothing to offer except a bed for weary travellers like ourselves. However, I learnt that Olive Schreiner (acclaimed South African writer), had lived in Hanover and that one could find her (uncelebrated) house if one climbed the koppie in Hanover. We opted, instead, for a nap and some quiet time at the pool in the beautiful green garden of the hotel. The hotel, I must add, is clean and nicely decorated – well worth the reasonable price to stay there. 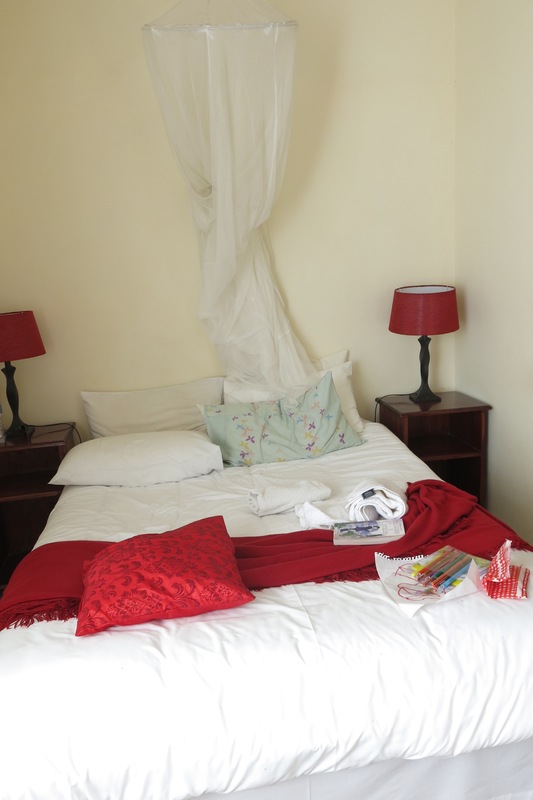 Oops – bed already napped on before I took the pic! We ate dinner in the quirky little bar amongst travellers and locals. It’s one of those places where the no-smoking rules that are enforced in big centres around the country don’t seem to apply. 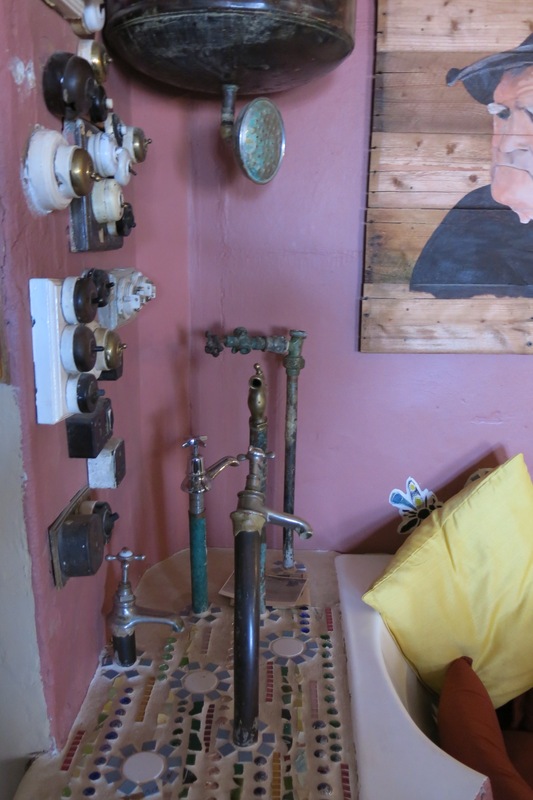 But we didn’t mind – the food was great and there was a lot on the walls to keep us entertained. 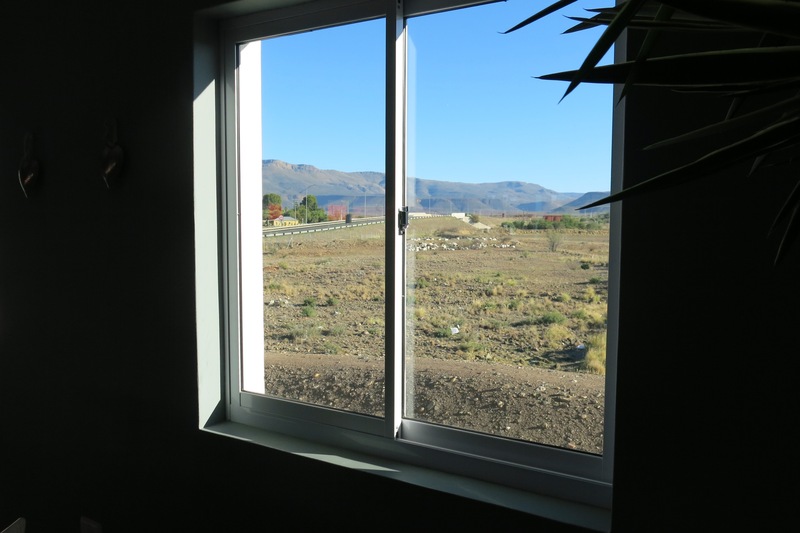 I didn’t love that poor Karoo children came to the window to beg – it left me feeling very uncomfortable in my white privilege. I closed the window. Shame on me. We opted for an early night and an early start. The sun hadn’t considered emerging yet when I packed the car and woke the children. Sadly, I hadn’t been able to find a good parking spot from which to push-start the car easily, and the sole person on the road at that time was a young man who was weaving so badly from his big night on the town (I wonder where one goes big in Hanover!) that I thought he was going to throw up when he tried to push my car. Luckily, some good Samaritans happened to be leaving the guest lodge at the same time as us, and they helped us push (thank you, Amanda Palmer, for teaching me to ask for help when I need it!). We were on the road again! And it was still dark, which has its own kind of magic. Night driving is not my favourite thing – cars’ lights hurt my eyes, particularly when I haven’t even had a coffee to wake me up. But not long into our morning journey, the sun started to change the colour of the landscape, and the beauty of the Karoo emerged again. I witnessed a magical moment, just around the Northern Cape/Western Cape border, with the sun turning the world golden, when I saw hundreds of lambs being called for their morning meal, all gambolling towards the farmhouse. My children were asleep and missed it. It was one of those moments that one will probably never capture on camera, but which are so simple and memorable anyway. 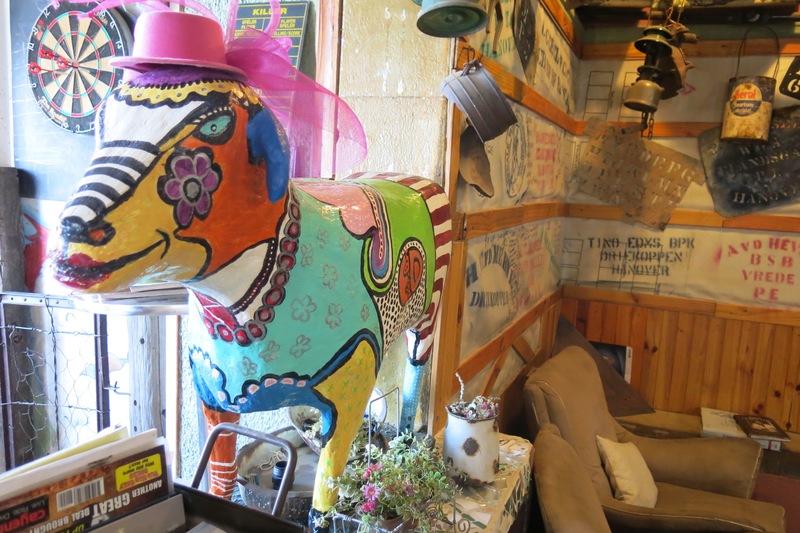 I pushed through without coffee to Beaufort West (particularly because I didn’t want to stop at another Wimpy-type shop), and there we found the most wonderful cafe to have breakfast – Four Sheep. It was stylish (and not in that typical small town kitsch way!) and the food was excellent. It was topped off for me by an excellent (if bleak) view of the vast, dry Karoo. We pushed on (literally) and cheered as we hit the lush winelands of Worcester area. I wasn’t so cheerful that the traffic-calming measures meant that the average speed allowed was about 80 (I really just wanted to get to Cape Town at that point) but I was impressed with the average speed measuring system, which probably ensures that most drivers don’t only slow down for the speed traps. We didn’t hold our breath through the Paarl tunnel but we did reminisce about our holiday in Italy last year where we noted the tunnels. After a quick call to my sister, we decided to meet at the end of the Cape Epic mountain bike race on a wine farm. That was quite exciting, watching all the dirty bikers come in. Once we had set up camp at my sister’s beautiful designer house in Hout Bay, we did several little day trips to visit friends and family in Cape Town. We trekked to Somerset West to see my dear friend who recently moved to the Cape, only to find herself suddenly single. Thankfully Somerset West is full of friendly Johannesburgers, as we discovered in the battery shop, where I finally replaced my battery. Such a coincidental experience there – I mentioned living in Westdene in Johannesburg. The woman behind the counter said she had worked in Melville (my neighbouring suburb). The other man who worked there said he had grown up in Greenside, just up the road. We were reminiscing about the Westdene bus accident when then the customer behind me in the queue said that he had gone to the school whose bus had crashed into the dam! Small world. After a gorgeous trip to the beach, we said our sad goodbyes and trekked back to Cape Town (which really wasn’t far at all!). 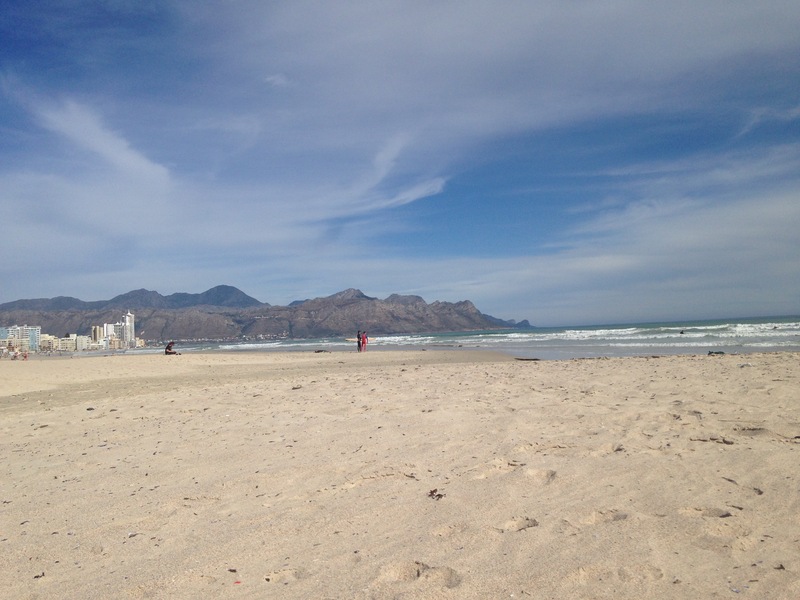 In Hout Bay we had a number of walks on the beach (and my brave child actually swam in that freezing water!). 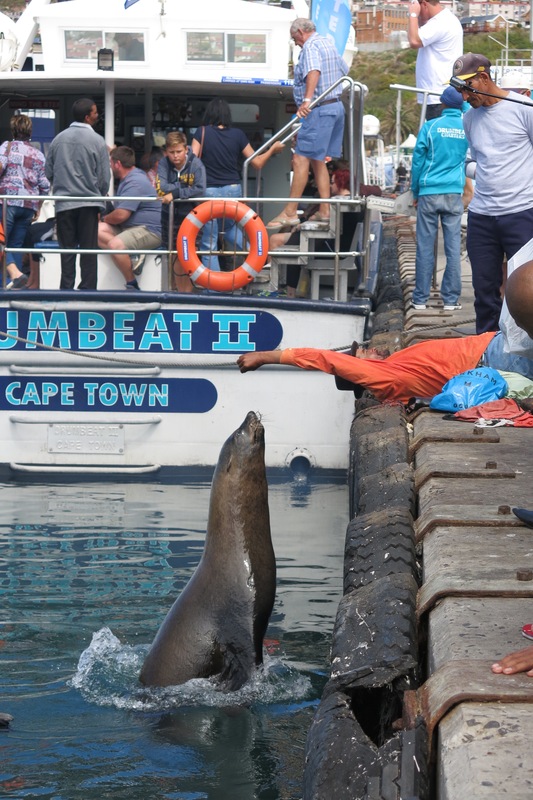 We also enjoyed a visit to the harbour where we got fish for a family braai, and watched a local man feed the seals (from his mouth even!). 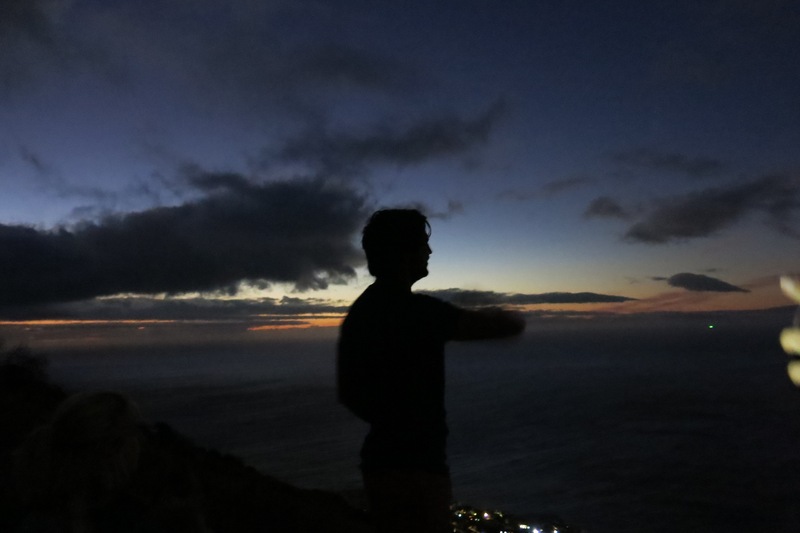 Instead of facing the crowds and going up Table Mountain to watch the sunset and the full moon rise (okay, we tried to, but the tickets were all sold out), we climbed up Klein Leeukoppie in Hout Bay for a picnic. It was a pleasant walk, although we soon ran out of light. The sun setting over Llandudno beach is always something to be treasured. 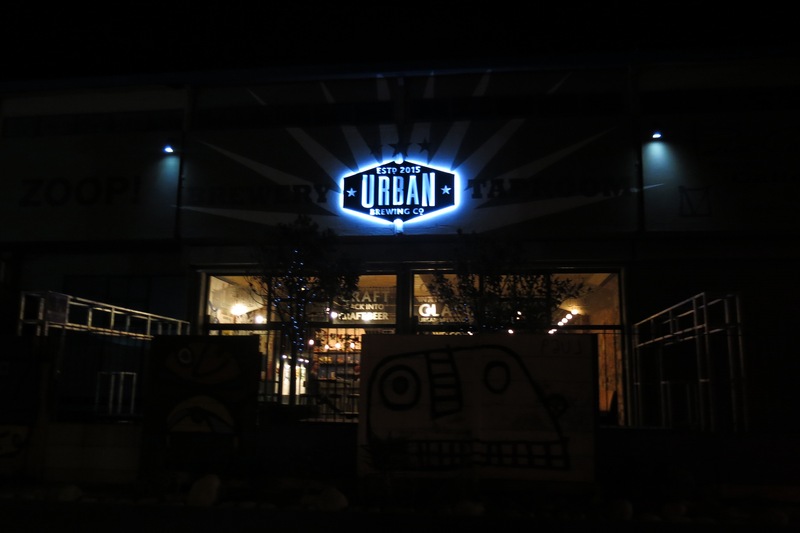 After we saw the moon rise (thankfully the clouds parted for a perfect sighting) we went back down to the harbour to Hout Bay’s newest addition, Urban Brewing Co. It’s a great spot to hang out and their beer is really good. Highly recommended. At supper with sisters in love at Ruggafellows in Hout Bay, we accumulated another cousin for the night. The following day, we had lunch with an old friend at Fish Hoek beach, which never changes, no matter how many years pass. 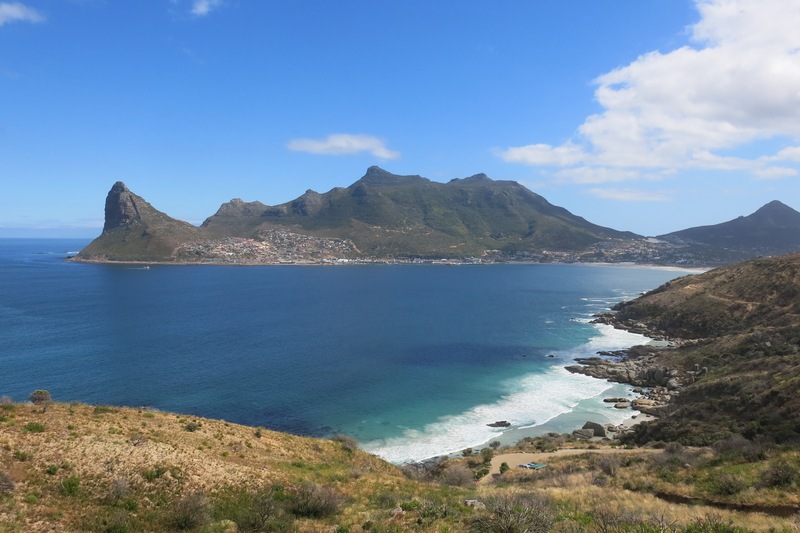 Then I took the girls to the Scratch Patch in Simonstown – one of our favourite places to go. 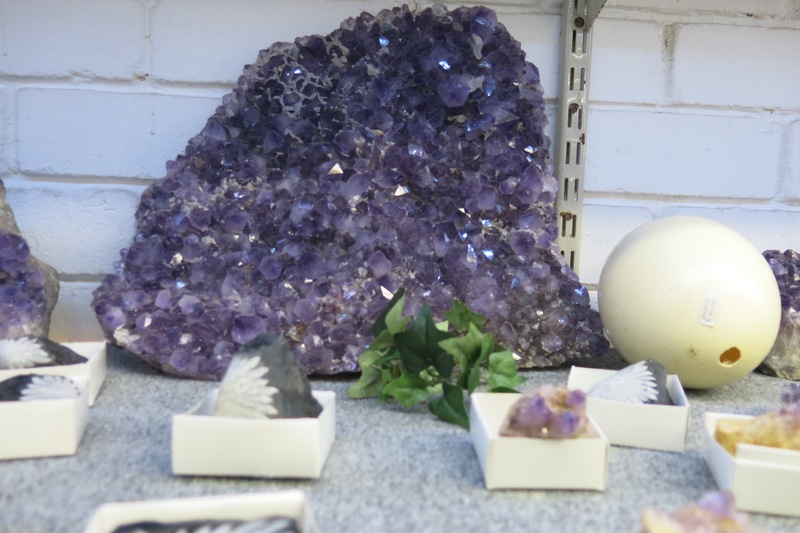 There we spent a good hour trawling through the scratch patch choosing our treasures, and also marvelling at the crystals in the shop. My youngest generously treated everyone to an ice cream. We met a friend for a walk on the promenade in Sea Point one morning, but the wind was howling so badly that day we thought her toddler might be blown away. We opted for tea at the Winchester Mansions rather, which was much more pleasant. 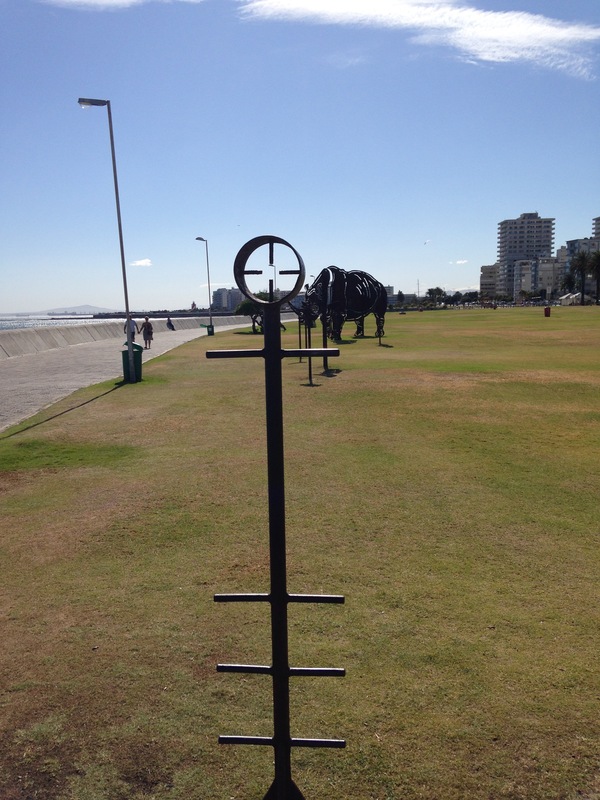 I do love the promenade though – public art installations, the sea, a view of Robben Island… just gorgeous. 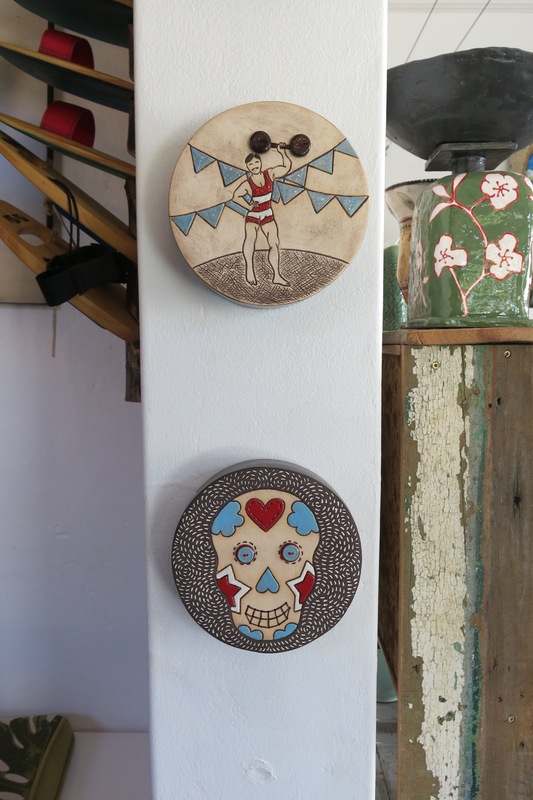 We visited our dear friends in Obs and ate at an American diner which served delicious hotdogs, and returned to their gorgeous artists’ residence and caught up on our lives. 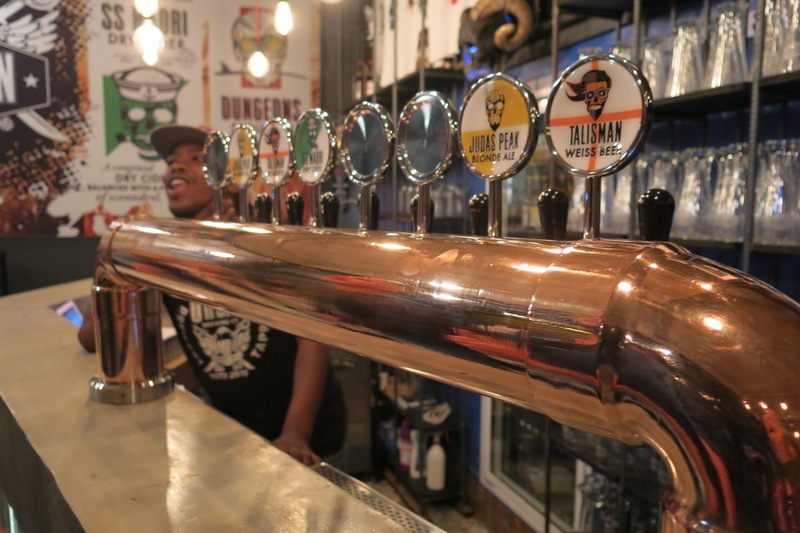 These are the things that make Cape Town feel like home for me. 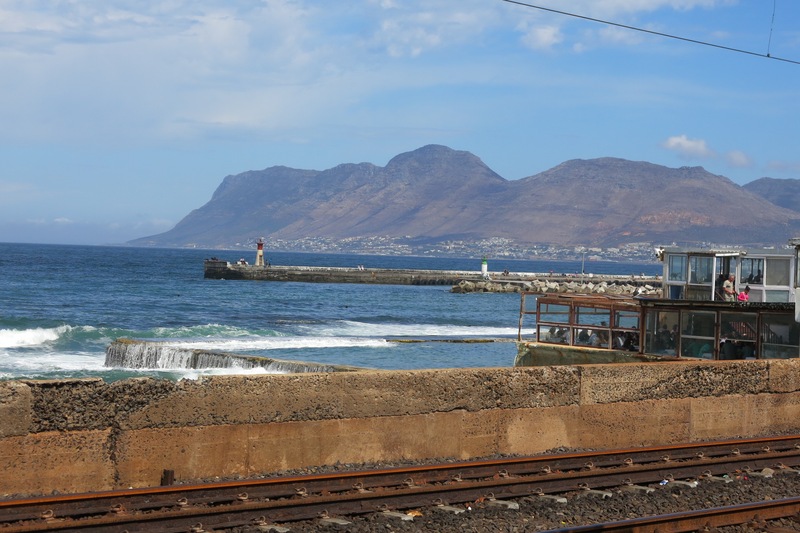 And of course, no trip to Cape Town is complete without a visit to Kalk Bay and lunch at the Brass Bell. We shopped in some of the little quaint Kalk Bay shops (summer clothes for the child who had dressed for winter, a look in the ceramics shop, a necklace bought with aunty’s late birthday money which sadly disappeared in the splash pool at the Brass Bell) and had a delicious meal, as always, with a stunning setting. 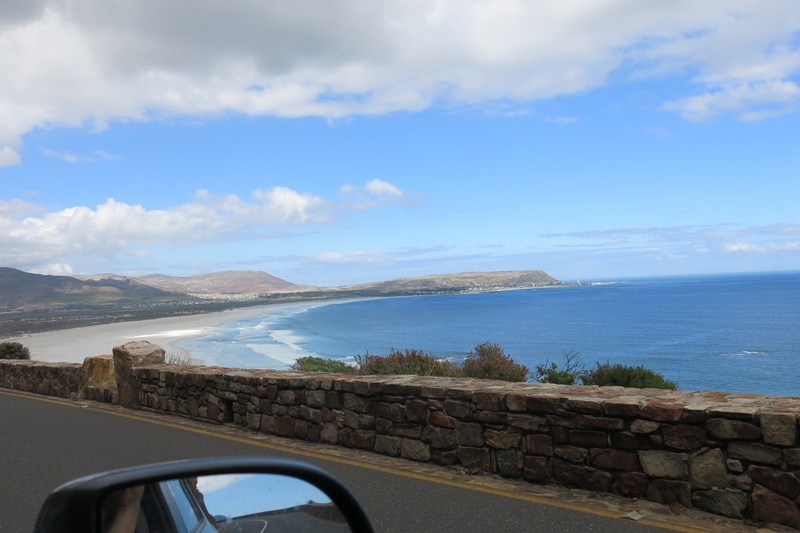 Took the beautiful drive over Chapman’s Peak back to Hout Bay – essential for our last day in Cape Town. The work the roads department has done on maintaining that road is truly remarkable, but every time man tries to tame the mountain, the mountain comes back with an extra little something to show who is boss. I love that. Sadly, all good things must come to an end, and I didn’t want to be driving on Easter Monday when the traffic would be horrendous, so we left a rainy Cape Town on the Saturday of the Two Oceans marathon with tears in our eyes (and a hangover in my head, because no trip to Cape Town in complete without my sister and my brother-in-law and at least one of his sisters and I having a party in their lounge!). I bumped into an ex-student on mine at a Wimpy outside Paarl, someone I hadn’t seen in at least 15 years. She was amazed that I remembered her name. I wasn’t – they worm their way into my heart, these students! 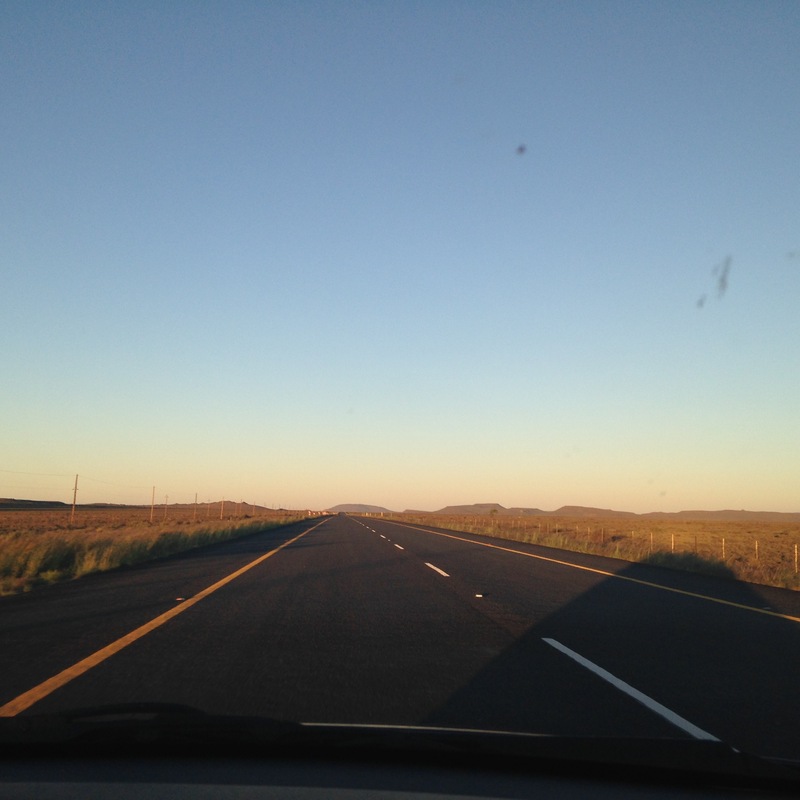 We had left later than anticipated, and I struggled a little on the drive to Colesberg. A stop at a Padstal in the winelands ensured we had enough supplies to keep us stuffed with tasty treats for a while. After a late lunch at the same cafe in Beaufort West, the caffeine kicked in nicely and we hit the road again and I could marvel at the most beautiful golden light, which weirdly turned the Karoo light green, as the shadows grew longer and the sun set. We spent the night in a room in Colesburg, tired but elated after such a wonderful holiday. The girls and I took some time out on the lawn on plastic chairs to look at the stars – an amazing display that we never see in the bright and polluted air of Joburg. We tried to identify constellations but didn’t get much further than the Southern Cross and Orion’s Belt (which my youngest used to call Brian’s Belt). We opted for an early start again, before sunrise, and thankfully didn’t have to push start any more. The final stretch on Sunday morning was most pleasant, and we were all happy to cross the Vaal River into terrain that we know well – our home province: Gauteng. Saw our first accident of the whole trip just outside Soweto. I was very grateful not to have had to experience anything traumatic along the way. I would really recommend taking a drive through this vast, varied and very beautiful country. There are so many interesting little towns to visit, each with their own charm. The people we met along the way were most friendly. The roads are in good shape and well maintained. 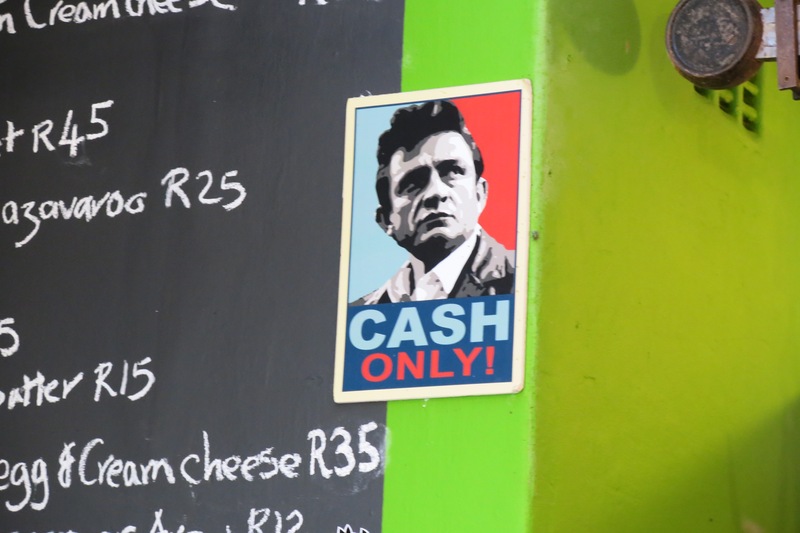 Even the South African drivers – who are notoriously bad – seemed to behave themselves during our journey. Next time you plan a trip to somewhere in South Africa, please consider driving. I’m sure that you, like me, will enjoy the feeling of awe as you pass through this amazing land. What a beautifully told story of our lovely country! Thanks Elaine. Take a breather half way! Very nice indeed. 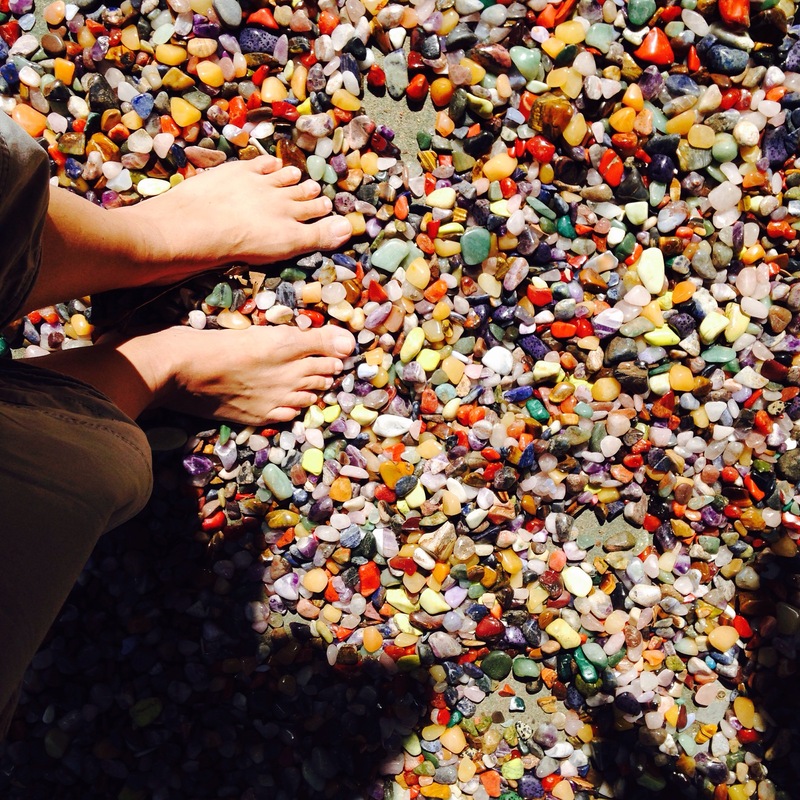 Loved those precious stones with their lovely colours.